Scientists from the Leibniz Institute of Plant Genetics and Crop Plant Research (IPK Gatersleben) participated to perform the assembly of the genome using the method of 3D-Conformation Capture Sequencing (Hi-C). Thanks to the sequenced durum wheat genome, the researchers were able to unravel its domestication history, going as far back as to the progenitor species wild emmer wheat (Triticum turgidum ssp. dicoccoides). The information provided by accessing the complete genome has already been utilised to gain new knowledge on the genetic properties of the important cereal species. By comparing the genomes of emmer and durum wheat, a mutation was found in the more recent crop plant, which is leading to an undesired accumulation of the heavy metal cadmium in the harvested grains. This discovery now enables plant breeders to selectively breed modern durum cultivars by removing the mutation to reduce cadmium content in grains and pasta. The production of pasta requires very sticky, glutinous flour, which can be catered for by using wheat with a high percentage of gluten proteins in the grain. The tetraploid durum wheat (Triticum turgidum L. ssp. durum), also known as pasta wheat, produces grains with the ideal protein content for the manufacturing of tasty pasta products. Next to bread wheat (Triticum aestivum), durum wheat therefore counts as one of the most important wheat species. Durum wheat originated from domesticated emmer wheat (Triticum turgidum ssp. dicoccum), the first evidence of durum wheat dating back to about 6,500 – 7,500 years ago. Domesticated emmer wheat itself was derived from wild emmer (Triticum turgidum ssp. dicoccoides) in the Near-Eastern Fertile Crescent about 10,000 years ago. Durum wheat was established as a prominent crop plant only about 1,500 – 2,000 years ago. However, as continuous selection and breeding led to the modern durum wheat cultivars, it is nowadays regarded as an important milestone of the human-driven evolution of tetraploid wheat. An Italian-led international collaboration of scientists has now fully sequenced and assembled the genome of the durum wheat cultivar “Svevo”. Its tetraploid genome has a size of 10.45 Giga base pairs (Gbp), slightly smaller than the 15 Gbp large genome of the hexaploid bread wheat, which was fully sequenced a year earlier. 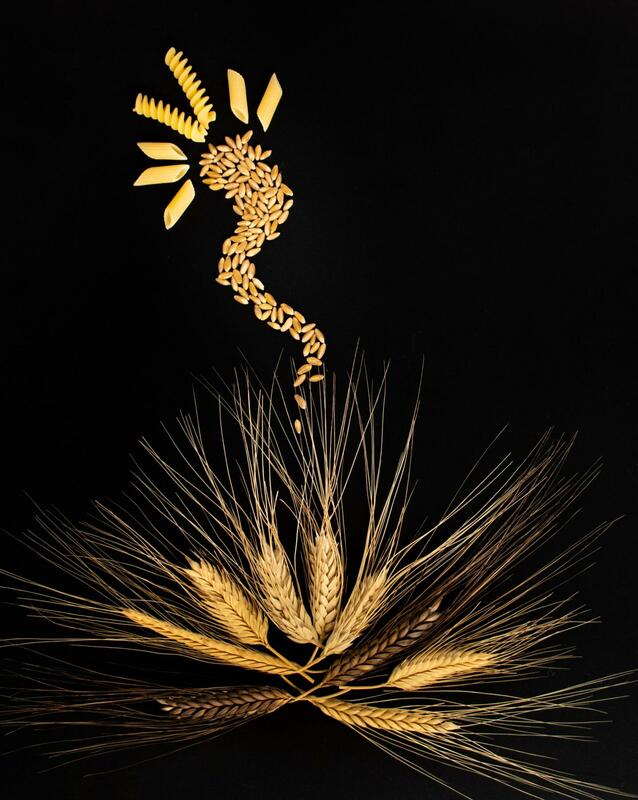 As part of the durum wheat project, Dr. Sara Milner, Dr. Axel Himmelbach, Dr. Martin Mascher and Dr. Nils Stein of the Leibniz Institute of Plant Genetics and Crop Plant Research (IPK Gatersleben) took on the fine-tuning of the genome assembly process using 3D-Chromosome Conformation Capture Sequencing method known as “Hi-C”. This approach allows for the precise mapping of the linear genome sequence, by detecting and allocating genome sequences, which are in proximity to each other due to their three-dimensional folding in the nucleus. Utilising the fully assembled genome, a global survey of the genetic diversity and selection signatures of 1,856 samples of the “Global Tetraploid Wheat Collection” was conducted. The resulting genome wide genetic diversity analysis of the entire spectrum of tetraploid wheat enabled the researchers to trace durum wheat’s genetic path back to its origin, whilst illustrating the consequence of thousands of years of empirical selection and breeding within the wheat genome. As such, the scientists found that the genetic diversity had especially been reduced during the domestication from wild emmer wheat, while subsequent adaptation, selection and breeding of the landraces of durum wheat and led to a comparatively mild decrease of the genetic diversity. Through the direct comparison of “Svevo” with its wild progenitor, the scientists identified a mutation on chromosome 5B, which resulted in two alleles of the gene TdHMA3-B1. The original allele, TdHMA3-B1a, was found in the emmer accession and coded a cadmium transporter, which reduced the cadmium-content within the grains. The mutated allele, TdHMA3-B1b, however caused the transporter to fail, leading to a higher content of the toxic heavy metal in the modern crop plant. Further investigation proved that this undesirable trait was widespread amongst recent durum wheat cultivars. Thanks to the discovery of the “high cadmium allele”, a hitherto unknown trait, which had unintentionally become established in modern durum wheat, was found. This knowledge now enables plant breeders to systematically breed new durum cultivars which no longer carry the defective cadmium transporter. The understanding of the domestication history of durum wheat and its effects on the genome, showcase the usefulness of genome analysis in modern wheat breeding. Genome analysis has become a key strategy for the identification of useful alleles, supporting breeding efforts such as reducing toxicity but also increasing grain yield, quality or wheat resilience. Durum wheat (Triticum turgidum L. ssp. durum) is used for the production of pasta due to its high protein content. Durum wheat was selected from emmer wheat, which is the domesticated form of wild emmer wheat (Triticum dicoccoides). International collaboration of scientists for the sequencing of the durum wheat genome. This included researchers from the IPK, which used 3D-Capture Sequencing (Hi-C) to assemble and anchor the genome. The team determined the changes in the durum wheat genome which resulted from thousands of years of empirical selection and breeding. A mutation was identified in modern durum wheat, which led to the undesired accumulation of cadmium in the grain. Findings were published in Nature Genetics.